Robert Morris of Cornell University launches a self-replicating worm as part of a research project designed to determine the size of the early Internet. It was intended to count the number of computers that initiated connections when the worm was loaded onto them. 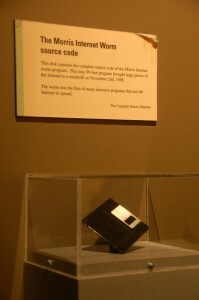 However, due to a programming error, the “Morris Worm” began repeatedly infecting machines, clogging network traffic and causing machines to crash. Eventually the worm spread to 6,000 machines, which was roughly 10 percent of the Internet at the time, causing significant downtime for government and university systems for two days. Morris was dismissed from Cornell, sentenced to three years probation and a $10,000 fine.